That's me. 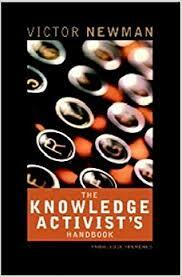 I'm definitely, 100% a knowledge activist. This resonates with me. What does it mean when something "resonates"? It's so close to how I think about the subject that I could have said it. It articulates a thought that I can immediately absorb and make mine. It makes me want to say "That's exactly right! Well said, Mr. Newman!" It's also probably a manifestation of confirmation bias. Reading something that resonates with me is a psychological boost. Doesn't it make you feel good to find people who totally agree with your point of view? Doesn't it confirm that your thinking is right? You're on the right track... keep going on that path. I like this book because it resonates with me as already mentioned above. I also like it because it's written very clearly from a personal experience perspective. Give me two books on KM, one written by an academic and one written by a practitioner and it's likely I will prefer the one written by the practitioner (another source of bias, notwithstanding the Ph.D after my own name). In light of recent re-readings, this may not be based on any evidence. I like Dr. Leonard's books and she's definitely an academic. What I probably meant just above is that I connect more readily to first-person, practical, hands-on, experience-based advice and analysis than to theoretical frameworks. Perhaps it's just the lazy path that gets the least resistance. Perhaps it's something else. There is something here worth exploring a little deeper because I like analytical frameworks. I just don't seem to connect well to overly theoretical/abstract frameworks (and questions like "what is knowledge?"). "Small grains of truth with the potential to create a pearl." That's perhaps what I'm attempting to do with this 30 days/30 books challenge. Can 30 days of little insights gathered from KM books add up to a single little valuable pearl? There is nothing more intrinsically rewarding than a burst of insight or even a poorly articulated question that just pops up and percolates for a while. Seek out KM literature I don't resonate with (something about how AI will revolutionalize KM would probably be easy to find at the moment and will definitely NOT resonate). Put this book on the "Re-read slowly" list. Let the practitioner/academic, how-to/abstract dichotomy percolate for a while. Seek some insight about where I stand. Where is the person who is highly focused on the practical, the implementable, yet sees the bigger picture, has a strong analytical framework to work with?